Dear Zinc is a regular advice column for high schoolers and their parents, written by Matt’s company, Zinc. I go to a small school so I’ve been hearing a lot about college and college counseling from the teachers and older kids for years. Plus, my brother already went through it and it was stressful to be around. I wouldn’t say my parents are college obsessed, but they are definitely involved and have pretty high expectations (though they would deny that). If I ask my parents for help or advice, they have a million opinions and suggestions. So do other kids and teachers. I’m already feeling overwhelmed by everything. My parents and I are going in to meet my college counselor for the first time next week. What should I be doing right now? Everyone in this process means well, including, obviously, you. It’s just one of those emotion-tangling times when the tides of life overlap and everyone needs all the help they can get to navigate the cross currents. Put yourself in your parents’ shoes. They may have an odd way of showing it — like, by going to the office and working all weekend or yelling at you for neglecting to clean the cat litter again — but you’re probably more important to them than eating. And college will rip you from their lives (sort of) and launch you straight out into the world they’ve spent so much energy protecting you from for the last sixteen years. They’d really love to have all the answers for you. Of course, they don’t, so they’re compensating by talking a lot. Put yourself in your shoes. It wasn’t that long ago you were filling your Club Penguin coffers with gems and rings. Now you’re juggling rinsta, finsta, SAT, stoichiometry and the Treaty of Westphalia, and you’re somehow also supposed to “fall in love with ten colleges” or find your life’s true calling. And all of this is meant to prepare you for that looming menace called “adulthood” when you’ll somehow be expected to make your own way in the world. The writer Mo Ogrodnik has described coming-of-age as journeying into one’s aloneness. When we are finally left to ourselves, we notice paths meant only for us. Tough to do that while keeping up with teams and homework and social media, aka, being normal. Still, for many of us, the college process is the first of many opportunities to figure out what matters to us and act on it. There’s a world of difference between freedom from — as in, “freedom from my parents telling me what to do all the time” — and freedom to — as in, “freedom to choose what to study or who to be.” Take stock of yourself and prepare to make choices. You can start by making two lists. Before your counselor meeting, make a list of any activities and experiences that have mattered to you. You need not make a formal “resume,” but writing them up in a form you can hand to the counselor is a good idea. They need to get to know you, and people love lists. Just make sure to include the color commentary. Instead of just “camper – Camp Sarsaparilla,” clarify that you spent your summers without electricity growing your own organic food. The second list should be a very preliminary list of colleges. Look up some schools online. Your preferences may well change, but notice what appeals to you — big university with lots of graduate schools or small liberal arts college that emphasizes undergrad teaching? Major metropolis or tiny college town? Do you want to stay near home or go far away? There will be many other factors to consider. What will your transcript look like? What test scores will you present? Where will you get the best financial aid package? No matter the answers to any of these questions, you will have choices to make, and, at the end of the day, some or all of these choices will be yours. Take a deep breath, A.O. Give yourself a pat for asking this honest question. Put your phone in a drawer in another room. Go for a long walk. Free-write in your journal. Meditate. Visit a house of worship or a museum or a park. Look for other opportunities to tune yourself in. “So. Mr. Bar-deen. From Princeton… to this.” Cody Silver, my colleague and (tor)mentor in my first semester of teaching at an inner city school revels in my predicament. He’s referring to way more than the peeling paint and worn asbestos tiles. We’re at the height of the crack epidemic at a high school selected as one of the ten worst in New York City, but Cody’s not worried about a drive-by shooting. The stories of kids bringing weapons to school make great tabloid headlines but feel arcane compared with what we’re about to face. It’s 7:20 AM. The calm emptiness in my generously proportioned classroom belies the impending torrent of humanity, the way sunshine might confuse a fly drifting toward a final encounter with a windshield on a freeway. “What are you gonna do about it? Write an editorial in the New York Times?” Cody was mocking me, but, Yeah, I thought, my insights about this experience belonged in the New York Times. One problem: I didn’t have any insights. What would I write? That these awfully nice kids deserved a better chance? Better teachers? Would I share some great success story? Given that I had recently graduated from Princeton, having been accepted there as a valedictorian, student council president, two-sport athlete and thespian with wonderful SAT scores, I felt certain something would come to me. Some great insight that would transform my students – all of them – or at least some of them – maybe just a few of them, from my two sections of 9th grade repeaters to my ESL section to my 9th grade Honors English to my decidedly mixed “Drama Majors.” My hard work and high intelligence would soon overwhelm the benighted ignorance and intellectual indifference of my students. Success had to be just around the corner. At the very least, I thought, there must be many, many others like me graduating from top universities who would prefer work with real social value to the suits and ties of corporate America. I could recruit them and together we would find solutions. Surely my presence mattered and would make a difference, but my Sisyphean days disrupted my fears and hopes alike. My college friends who worked in banking could mollify their horror at my low-status job by professing respect for my courage. Others admired me for “making a difference.” But I wasn’t in any danger and I certainly wasn’t making a difference. In truth, I was a low-paid fraud. The impulse to teach had come over me at Thanksgiving of my senior year in college when I met Tom, the older brother of a friend of a friend who was teaching at a high school in New York City’s Hell’s Kitchen. I had made no effort to join the majority of my classmates who popped up sporadically, crossing campus in new pinstriped suits on their way to interviews with Wall Street recruiters. I needed a job. At the height of the crack wars, New York City needed teachers so badly that a university diploma would all but entitle me to a license. On a crisp January day, I left Princeton’s Gothic arches, generous lawns and broad bluestone paths and took the grimy New Jersey Transit train to Penn Station where I caught the even grimier C train to 50th Street. My heart racing with fear and anticipation, I walked through deserted streets to find Tom at Park West High School. When the bell rang and the empty halls suddenly surged with rambunctious, inner city teens, I had to tamp down my panic. Would the mob attack me? Would someone quietly slip a shiv between my ribs just for the heck of it? Though at 6’5” I stood a surprising head taller than all of them, I found myself invisible. They took about as much interest in me as they took in the wastebaskets. Tom, a kind-hearted San Franciscan who’d played soccer at Williams, seemed to expend great energy in eliciting any kind of response from his half-empty classes. His students slumped in disorganized desks, doodling or offering one-word answers to questions like, Why do you think George wants to help Lenny? Nothing I saw dissuaded me from wanting to walk in Tom’s shoes, but I felt even then the first tug of an unexpected disappointment. No one was pulling out a gun or a knife. I didn’t see any drug deals or violent behavior. Even that first day, however, my enthusiasm for righting the wrongs of racism, poverty and injustice took a slap from an unexpected yet pervasive foe: nothing. What made Tom’s students so passive? How would I help such students succeed? How could themes and ideas – even those of the greatest works of literature – stand up to the abyss of emptiness and futility that absorbed Tom’s carefully worded provocations like a gale snuffing out candles. Several months later, breathing the Now-or-Later and hair relaxer perfumed air of my own classroom, the downer feeling I’d felt in Tom’s class had metastasized. These were the good kids. The bad kids, as evidenced by the half-empty rolls of my 9th grade repeaters, stayed on the streets and rarely showed up to school. My students – many of them anyway – believed in “education”. Their parents worked long, hard hours at low-paying jobs with little or no future. These kids wanted only to follow the rules, stay the course, go to college and find well-paid work. They all wanted to be doctors and lawyers. They assumed that staying in school and off the streets led to that outcome. 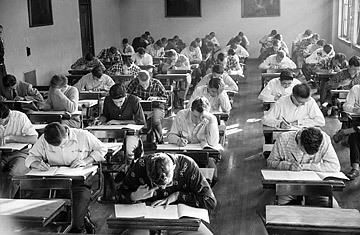 I didn’t dare tell them that no one from Mabel Dean Bacon Vocational High School had a prayer on the LSAT or MCAT. But I was there to change that.